Salads are a combination of ingredients that are quick and easy to make. It’s a way to make up for your daily vegetable requirement too! Use of different types of dressing can make them a healthy and flavoursome addition to meals. Orange Dressing, Sesame Dressing, Lemon dressing are some types of dressing that find place in this section. Not just veggies, but a variety of fruits, paneer and beans / sprouts can be combined together to make a healthy salad bowl. These salads can form a part of meal or most of them can be enjoyed as a small snack in between meals too. Addition of leafy vegetables in the form of salad has also been focused in this section. On days that you are bored of having leafy vegetables in the form of subzi. Eating any one salad from those listed in this section is one of the healthiest habit a mum-to-be can adopt, is what experts say. So go ahead and explore the range of salads especially designed for you to meet your nutritional needs during these special nine months! You can make your salads protein packed by adding sprouts, dals or even curds and paneer. Cabbage and Moong Dal Salad is sure to tickle your taste buds and satisfy your hunger pangs without giving you any empty calories. Rich in protein, fibre, folic acid and iron, this simple salad is good for a mid-morning or a late afternoon snack too. Adds fruits to your beany salads like this Sprouted Fruity Bean Salad where nutritious sprouts pairs well with invigorating orange and tomatoes, balanced carefully with sweet bananas and grapes to give a punch of antioxidants, vitamins and minerals. Paneer aur Hare Chane ka Salad provides a protein top-up and good dose of fibre and vitamin A both of which are important during pregnancy. Lettuce and Apple Salad With Lemon Dressing contains iron rich lettuce and celery teamed with crunchy apples to raise your haemoglobin levels. Being laced with a vitamin C rich lemony dressing it helps to enhance the absorption of iron further. Watermelon and mint always taste best together, but are you aware that there is more good reason to combine them? Watermelon and Mint Salad is an amazing recipe to be had during the first trimester of pregnancy as watermelon is an excellent source of iron, while mint has not just iron but vitamin C too. Iron and vitamin C work best as a team as the latter is needed for iron to work best. Pear, Apple and Date Salad with Orange Dressing is a good source of iron, vitamin c, calcium and carbohydrate which is the source of instant energy. It will perk you up almost instantly. It makes a great snack that can be assembled quickly at any time using all your favourite fruits. 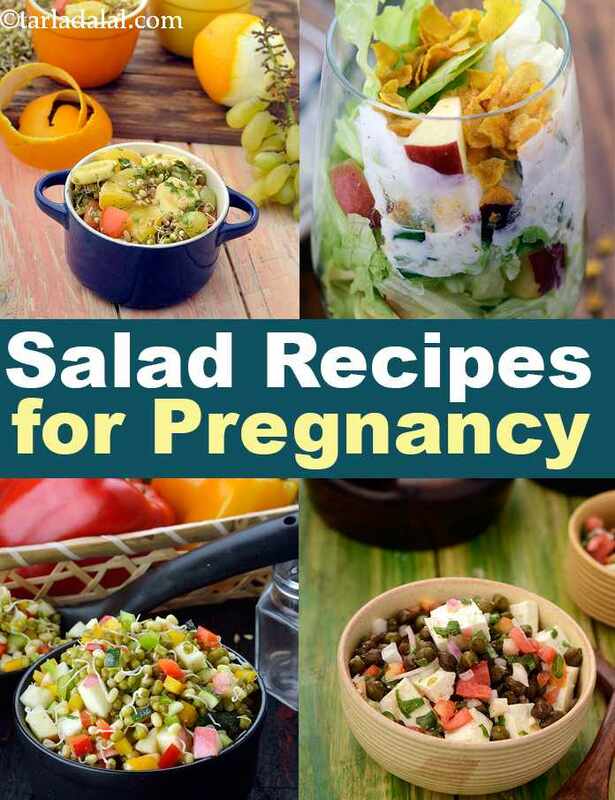 Enjoy all our salad recipes for pregnancy. Explore more varieties in our pregnancy section everyday. Calcium laden lettuce and celery in a calcium rich curd dressing......... serves as a perfect accompaniment to any main course.